"This is the best I've made. It tastes like the ones I have tried at Chinese restaurants." Bring the vinegar to a boil in a small, non-reactive pot, and mix in sugar until dissolved. Reduce heat to low, simmer 5 minutes, and remove from heat. Mash the garlic and salt into a smooth paste, and mix into the pot. Stir in the red pepper flakes. Cool to room temperature before using, or store up to 2 days in the refrigerator. A traditional sweet and sour sauce for meatballs, tempura, egg rolls, and more. It really does taste like that at the Chinese restaurants. Very good, spicy! I thickened it a little with cornstarch as I was using it as a dipping sauce for fondue. This was a bit too 'vinager-ish' for us. Perhaps next time, I won't use as much rice vinegar, although this was a nice concept. This sauce is outstanding! I also thickened it with cornstarch (about 1 TBS).. The chilis gave it a fantastic color and flavor. I will definately be making this again.. thanks much! 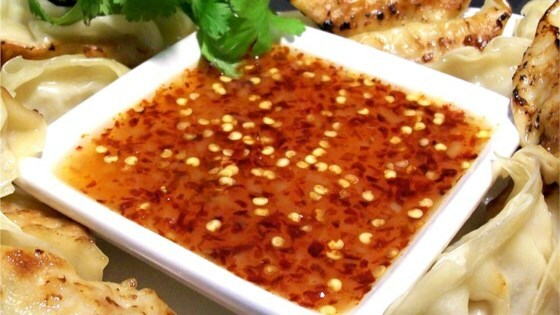 Fantastic sauce for eggrolls or wontons. It is meant to be on the thin side to gently flavor, not coat, items. Just like the good oriental restaurant versions.